When the outlaw clan of foxes, weasels, stoats, and other vermin led by vicious ferret Sawney Rath kidnaps an infant otter of Redwall to serve as their Taggerung - a fierce warrior who no beast can stand against in battle - they have no idea what they're getting into. Trained in all the deadly arts and able to outfight, outrun, and outthink any clanbeast, the Taggerung grows up with only one slight peculiarity: he refuses to kill! What's a vermin clan to do when its greatest warrior is too pure of heart to live among them? The Taggerung is possibly one of the most amusing and suspenseful books of the series. It's filled with joy and sadness, difficult triumphs and resounding defeats. it has great mystery and a wealth of clarity delivered by some of the most memorable of characters, all of which can be found with friends and feasts here. Won't you come and join in? After all, the doors of Redwall Abbey are always welcome to any and all goodbeasts. If you could sum up The Taggerung in three words, what would they be? That the characters were both strong yet relatable. All of the different narrators bring a sense of being actual people. I love this style of narrating that uses multiple people, instead of just the one. If its not a Gold Medal book, it should be! What did you love best about The Taggerung? I truly and deeply cared for the creatures of Redwall, it amazed me that when one of the creatures was killed, I was in tears. The story was amazing and I just loved it all the way! What other book might you compare The Taggerung to and why? Mrs. Prisby and The Rats of NIMH. First of all, the main cast and crew are anthropomorphic creatures. Mice, Badgers, Moles, Rats, Foxes, Otters, and other such creatures are utilized to describe all the different manner of characters in the series. Secondly, its a young adult book. The vocabulary used in the book can be read and understood by young children, yet enjoyed by adults. The part at the end of the book where it put me in tears. 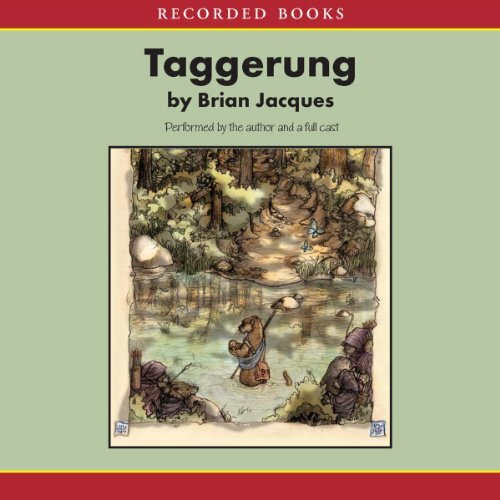 Would you consider the audio edition of The Taggerung to be better than the print version? Yes, Mainly because the full cast adds an extra zing to it. When I first heard of the Redwall series from my brother, I was a bit skeptical. Now that I've listened to it myself, I can easily say it is one of the most imaginative and funny stories I have heard in a while. Funny characters, excellent voice acting, great storytelling. Overall it's one that should listen to, and place in your library. It doesn't matter whether your young or old, you'll chuckle or laugh at some parts anytime you hear it. My first Redwall book. I enjoyed it a whole lot. Too bad the recording quality was so poor. I have only recently discovered the Redwall books. Each on brings new delights of description. This one made me want to laugh aloud at the antics of dibuns and hares, and cry over sorrows and partings. I hope others enjoy this book as much as I did. The way it's done is outstanding! Brian Jacques is a master of his trade! Taggerung was a surprise to me. I read the book itself a long time ago and I couldn't remember anything about it, other than the fact I didn't like it very much. But after listening to this audio I have to say that this has become one of my favorite books ever. Some of the Redwall novels can feel a little formulaic, but Taggerung manages to be unique without straying too far from the realm of what is expected in a Redwall book. The story, the pacing, the characters, and the settings are all done perfectly. The story knows when to be serious and when to be funny, and manages to be heartfelt at the right times as well. The main character's plight is a really understandable one, and it makes the reader vouch for him along his journey and want to see him succeed. While there isn't really a big main villain, I think the bad guys featured in Taggerung are the best Jaques has ever written. They are dark and dangerous, and intimidating, but he also manages to get some humor out of them as well. Gruven Zann is probably the funniest character in the entire book. That's my review of Taggerung. Whether you're new to the series or a returning fan, Taggerung is a heartfelt book that will keep you gripped from cover to cover. My fourth favourite Redwall book. After collecting and listening to every audiobook I’ve now started collecting all the Redwall books! Prepare to be immersed into a world of fun. This book is greatly written with such amazing world building that joy will forget this world. The only thing is that I imagined the voices to be very different when I first read the book. I bought this audio book after reading the book as a child, good cast, the author and narrator has a great voice, I wasn't too sure at first, being a Londoner I thought his scouse accent wasn't the best for narrating at first, I was definitely wrong though, it just takes a few minutes to get used to his accent then he sounds great. If you like the redwall series give this a listen, not a bad book to start on either though as you don't have to have read the series chronologically, I didn't actually, but I would start off with the legend of Luke, or Mossflower if new to redwall books.